"We are pleased to work with such a great partner like Emory Healthcare to develop a new model of cooperation and efficiency," said David S. Chernow, president & chief administrative officer for Pennsylvania-based Select Medical. 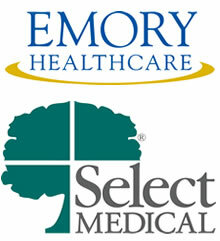 Emory Healthcare and Select Medical today announced their intent to form a new joint venture to improve post-acute care in Georgia. The signed letter of intent, subject to each party’s approval processes, is a key step to coordinated care for patients in need of long-term acute care, inpatient rehabilitation, outpatient physical therapy, occupational therapy and speech therapy at Wesley Woods Geriatric Hospital at Emory University and at Emory’s Center for Rehabilitation Medicine. As discussions of this joint venture begin, the two organizations are looking at options to strategically combine some Atlanta-based, post-acute services of Emory Healthcare and Select Medical to form a streamlined, cost-effective partnership focused on high-quality outcomes for patients and referral sources. "We are pleased to work with such a great partner like Emory Healthcare to develop a new model of cooperation and efficiency," said David S. Chernow, president & chief administrative officer for Pennsylvania-based Select Medical. "The joint venture will make it much more convenient for patients and for our referral sources. Beyond our core assets, each partner has core knowledge and expertise to contribute. For example, our Kessler Institute for Rehabilitation in New Jersey is ranked by U.S. News and World Report as one of the top two inpatient rehabilitation hospitals in the United States. The greater Atlanta community and patients will benefit from each partner actively sharing its respective expertise and lessons learned, not to mention offering a more seamless transition between care settings." "All sectors of health care are rapidly changing, and post-acute care is no exception," said John Fox, president and chief executive officer for Emory Healthcare. "People want more convenience, as well as the same level of quality they have come to expect from Emory Healthcare. At the same time, the demand to lower costs continues to grow. By joining forces with one of the nation’s leading post-acute care providers, Emory Healthcare will be able to offer patients leaving the traditional, general hospital some very high levels of coordinated care led by Emory physicians." Signing the letter of intent is just the first step in this process. The partnership agreement is subject to management reviews and Board approval by both Emory and Select Medical. Employees currently working for both Emory Healthcare and Select Medical will continue to deliver outstanding care in an integrated fashion. Select Medical and Emory Healthcare have collaborated on post-acute care since 2000, when Select Medical leased space from Emory University Hospital Midtown for its long-term acute care hospital. As highly specialized facilities for chronic critically ill and medically complex patients in need of additional recovery time, Select Medical’s long-term acute care hospitals are usually small. Much as it does for more than two third of its long-term acute care hospitals, Select Medical leases space from larger healthcare systems such as Emory Healthcare. By contrast, inpatient rehabilitation hospitals are typically freestanding facilities devoted to helping less acutely ill patients. This larger population of patients is generally still in need of intensive therapy to regain as much strength and mobility as possible before being discharged to a lower level of care or ultimately, home. By coordinating the various options of post-acute care, innovative health care providers can help ensure that patients are cared for in exactly the appropriate setting for their condition. Select Medical is one of the nation’s largest providers of extended acute and post-acute care. Select Medical’s nearly 30,000 people help operate more than 120 hospitals specializing in either long-term acute care or medical rehabilitation, and another 950 outpatient clinics offering physical and occupational therapy. Select Medical employs more than 300 in the greater Atlanta area. For more information, visit www.selectmedical.com.